My job at the Environment Agency focuses on the Catchment Sensitive Farming project around the Upper Great Ouse River catchment. The project is funded by Defra and involves working with farmers and landowners to reduce water pollution from agriculture. This project covers the upper reaches of the River Great Ouse and River Tove as well as two ground water protection zones – areas close to wells, boreholes, springs or other sources of drinking water. It is important that these areas remain uncontaminated with pesticides or nutrients to avoid pollution and additional costs that would then be needed to treat this water. Part of my role is to provide advice to farmers to help reduce phosphate and nitrate levels and sediment in watercourses. I work on behalf of both the Environment Agency and Natural England and host a number of workshops for farmers. I really enjoy having the chance to work closely with farmers, giving them advice to help improve the environment and in many cases help save farmers money in the long run. 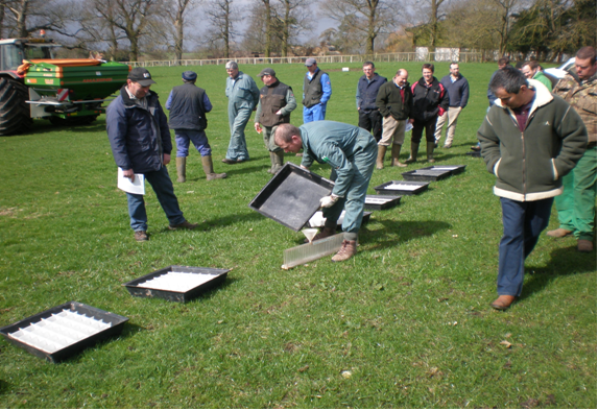 We help inform arable farmers how to calibrate spreaders regularly, analyse soil for nutrient levels and make better use of organic manures. We encourage livestock farmers to take action, such as fencing off watercourses to stop livestock getting in and putting drinking troughs onto hard surfaces to stop animals trampling river banks. The Catchment Sensitive Farming project offers free advice and a grant scheme. Over £130K has been given to farmers in the Upper Great Ouse area each year. These grants allow farmers to make improvements to their farm by providing a 50 per cent grant for work up to a maximum of £10,000 per farm. Over the years, these grants have allowed many farmers to reduce pollution by funding projects, such as improving pesticide handling areas, fencing off watercourses and managing dirty water storage areas. Click here for further information about grants. 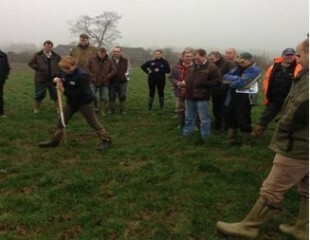 In order to talk with as many farmers as possible, I arrange a full programme of workshops and training events. I invite specialist agricultural contractors to advise farmers and topics cover a whole range of agricultural issues. We usually run these in the autumn and winter, as this is generally a quieter time in the farming calendar. 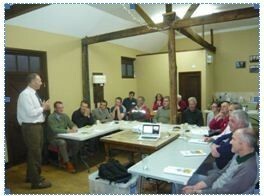 We have already run three successful workshops this winter involving around 70 farmers. These included a workshop to promote the project to farmers in drinking water areas and a joint workshop with the English Beef and Lamb Executive (EBLEX) to discus best soil management techniques for livestock farmers. 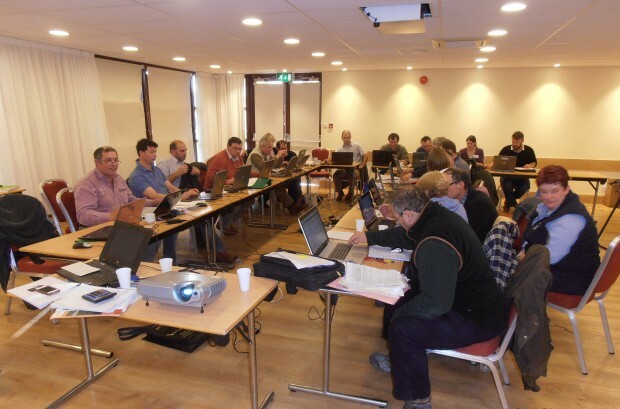 The last workshop before Christmas was a ‘PLANET' database day. Farmers must keep records of all their fertiliser applications. This database helps them to record what they’ve applied and work out what they need to apply to meet the Nitrate Vulnerable Zones (NVZs) regulations and provide maximum crop yield. Calculating this correctly helps to save farmers money and stops excessive nitrates being washed away into watercourses. It is great to have the chance to meet farmers face-to-face out on their farms. I can explain the benefits of adopting one or several of the many Catchment Sensitive Farming recommendations and it gives me an opportunity to hear how things work in practice. Although numbers are growing all the time, we still want to encourage more farmers to get involved with the project. While it can be challenging to explain the benefits of new environmental farming best practices, we have helped farmers to try out new techniques and find them beneficial. We also get some great feedback from those who attend our workshops. Farmers find them very informative and most want to come along to future events. We’ve heard that a number are keen to adopt some of the practices, which is very encouraging. We are keen to get as many local farmers as possible involved in these workshops. Please get in touch if you are interested in attending. My phone number is 01480 483291 or email simon.bateman@environment-agency.gov.uk. what do you do about the invasion of polytunnels in rural areas, we have flooding due to the erosion of the grass verges and blockages on the land drains which are not cleaned out on a regular basis. Nearby properties have had their septic tanks flooded causing really awful problems for the residents, another planning application has recently be put in for polytunnels in the same area where the flooding took place in 2011, although an irrigation reservoir has been included on the latest planning application, these residents who live in barn conversions and a listed building which are all Grade 11 listed are very worried that the flooding will happen again, the road adjacent to their dwellings was also flooded in 2016 therefore they were not able to get out to work or shop. What is the solution? You will need to speak to the planning authority in your area regarding permissions for poly tunnels. The council may ask the Environment Agency for input but it is ultimately the planning departments decision. You can call our customer services 03708 506506 or email our team at enquiries@environment-agency.gov.uk to give further details of the area, there maybe further information we can provide.